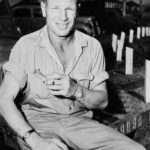 William Veeck also known as “Sport Shirt”, was an American Major League Baseball franchise owner and promoter. Veeck was at various times the owner of the Cleveland Indians, St. Louis Browns and Chicago White Sox. As owner and team president of the Indians in 1947, Veeck signed Larry Doby, thus beginning the integration of the American League. Veeck was the last owner to purchase a baseball franchise without an independent fortune, and is responsible for many innovations and contributions to baseball. Finding it hard to financially compete, Veeck retired after the 1980 Chicago White Sox season. He was inducted into the Baseball Hall of Fame in 1991. "Baseball is almost the only orderly thing in a very unorderly world. If you get three strikes, even the best lawyer in the world can’t get you off." "Every baseball crowd, like every theatre audience, has its own distinctive attitude and atmosphere."